This Crossgrade allows big savings for EZdrummers owners compared to first-time buyers of Superior Drummer 3. Your already installed Toontrack core libraries for the EZdrummer 2 will work work with Superior Drummer 3. All your already installed Toontrack MIDI will still work as well. 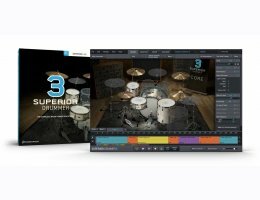 Building on the legacy of its predecessor, Superior Drummer 3 was redesigned from the ground up to introduce a completely new and improved workflow, integrated drum audio to MIDI conversion, 35 mixer effects, scalable interface, detachable windows, a comprehensive MIDI library and much, much more. Welcome to the future of drum production. Superior Drummer 3 is more than a drum production tool – it’s a virtual studio introducing endless possibilities for you to hone, shape and mold your drums without any thinkable creative restraints. The core sound library, boasting in excess of 230 GB of raw sound material, was recorded by award-winning engineer George Massenburg at probably the world’s most quiet and ideal location for sampling, the Galaxy Studios in Belgium. In addition to close microphones and several ambience positions, the Superior Drummer 3 setup also includes an additional eleven room microphones set up in a surround configuration, for use in anything from stereo all the way up to 11.1 systems. In combination with the large selection of extra instruments as well as the included pool of electronic drum machine sounds added for stacking and sound design purposes, Superior Drummer 3 gives you an incomparable palette of options to craft drum tones beyond your wildest imagination. The idea with Superior Drummer 3 is to let you step into a virtual studio with the best possible raw material and mix options at your disposal to create your drum sounds. With Superior Drummer 3, you are in control. Take a seat at the console to hone, mold, shape, mix, match, blend, saturate and create on your terms. Superior Drummer 3 is a complete drum production studio and the ultimate framework for creative sound design. 64-bit host (with support for VST, or AAX). Standalone is included. Want to learn the ins and outs of Superior Drummer 3? Check out the interactive user manual.